ab166789 is expected to recognize all reported isoforms of Amino-terminal enhancer of split/AES (NP_945320.1; NP_001121.2; NP_945321.1). Synthetic peptide corresponding to Human Amino-terminal enhancer of split/AES aa 12-24 (N terminal) (Cysteine residue). Human colon, submucosal plexus tissue; Human brain (cerebellum and cerebral cortex) lysates. Our Abpromise guarantee covers the use of ab166789 in the following tested applications. WB Use a concentration of 0.3 - 1 µg/ml. Detects a band of approximately 30 kDa (predicted molecular weight: 21, 29 kDa). Found predominantly in muscle, heart and Placenta. 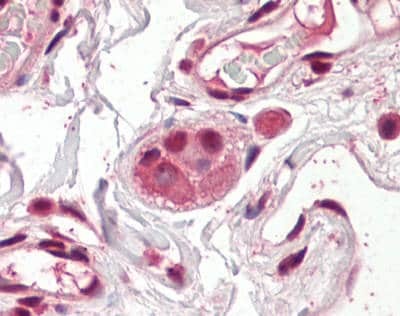 In fetal tissues, abundantly expressed in the heart, lung, kidney, brain and liver. Belongs to the WD repeat Groucho/TLE family. Lacks the C-terminal WD repeats. Immunohistochemical analysis of formalin-fixed, paraffin-embedded Human colon, submucosal plexus tissue labeling Amino-terminal enhancer of split/AES with ab166789 at 3.75&microg/ml. ab166789 has not yet been referenced specifically in any publications. Publishing research using ab166789? Please let us know so that we can cite the reference in this datasheet. There are currently no Customer reviews or Questions for ab166789.